Inle Lake is a peaceful area in Shan State, central Myanmar. Though there are already many Western amenities in place like spas, hotels, and even a local craft beer bar, tourism is just starting to blossom in Inle Lake. We highly recommend visiting before it becomes a major tourist hotspot. Nyanung Shwe is the biggest village on Inle Lake and where most tourists stay. It is a great starting out point to reach all of the Inle Lake sights and destinations, which surely include something for everybody. Here is our list of the top 10 things to do at Inle Lake, Myanmar. The five day market of Inle Lake are rotating markets where vendors from the small villages and rural areas come to sell their goods. The location changes daily but is always on the lake and some days is only accessible by boat. The schedule is based on the lunar calendar. It can be hard to know where the market will be from day to day, but any local will know if you ask them. Song of Travel hostel has the weekly schedule posted in the lobby with our daily activities. Our organized boat trips feature a trip to the 5 day market. There are a number of villages built on Inle Lake. 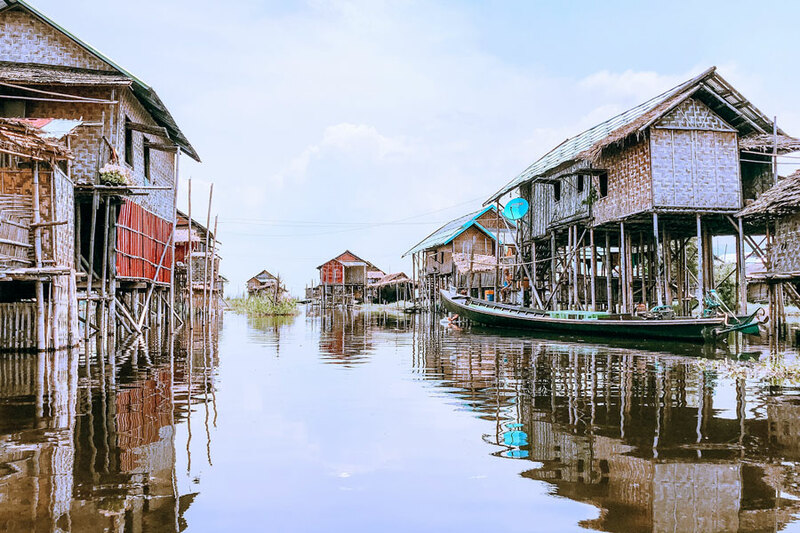 The homes are made from wood and are built on stilts high enough to accommodate higher waters during rainy season. There is a boat parked in front of every home and the water roadways almost resemble roads on land with consistent boat traffic. Boating through these villages is a great way to catch a glimpse of local life. Our boat trips include a lunch with a local family in a floating village. This is really a memorable experience. The long neck Kayan women are originally from Kayah State, bordering Shan State (where Inle Lake is located) but have migrated to other areas after conflict with the military in the 1980s and 1990s, with the majority of the population currently living in Shan State. One family of Kayan women live in Inn Paw Khon village and work as weavers. They can be seen on some boat trips and are very friendly, speaking surprisingly good English. Ask them why they wear the gold coils around their necks! Traditionally, tattooing in Myanmar was used as a cultural marker. Different tribes and ethnic groups would have unique styles of tattoo. The Shan people believed the tattoos had magical and spiritual meanings, similar to the Thai Sak Yant tattoo, and were used in the same way some cultures use protective charms and amulets. One of the few remaining traditional tattoo artists still has a shop in Nyaungshwe at Inle Lake. The tattoos are given with a bronze needle, sterilized in boiling water between uses. The tattoos are painful, but much quicker than other tattoo methods. You can choose from a book of traditional designs, passed down for generations. A traditional Burmese tattoo at Inle Lake is the ultimate souvenir! That’s right, there is a tofu village, also known as ‘Tofu Palace’. The small village of Khaung Daing is known for its tofu production. The local tofu is made from fermented yellow peas, and is generally loved by vegetarians and meat eaters alike. The village doesn’t only produce tofu, they produce a variety of edible delights to be sold at the local markets. Getting to the village is easy. Take one of our free bikes from Song of Travel Hostel Inle Lake and it’s about an hour ride. You can also get there by boat. Once you arrive you will be greeted by a local who will happily take you on a free tour of the village with samples included. Tipping is appreciated, but there is little pressure to purchase anything. This monastery is well known for its jumping cats. In the past monks would train the cats to jump through hoops during the long hours between scripture recitals. The last generation of jumping cats has mostly moved on leaving behind a generation of sleepy cats. While you may or may not see a jumping cat on your visit, you are sure to see many friendly cats and kittens all around the monastery. It is also the biggest and oldest monastery in the Inle Lake area, built in the 19th century of wood in the local style. It houses an impressive collection of Buddha images and the large mediation hall holds Buddha statues in the Shan, Tibetan, Bagan and Inwa styles. One of the highlights of any trip to Inle Lake is a visit to In Dein, sometimes referred to as ‘Shan Bagan’. 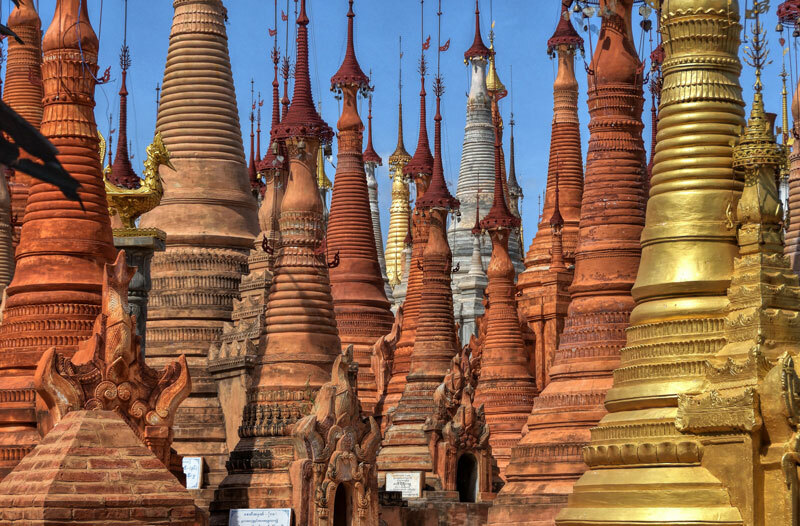 This massive collection of stupas was first built in the 12th century and added upon until the 18th century. In Dein, also spelled Inndein, is part of our organized boat trips and the stupas are just a short climb uphill from the lake. One of the 5 day markets occurs here, bringing locals from many villages as well as tourists. On quiet days your boat driver can sometimes bring you to the foot of the bridge at the entrance to the pagoda. Some of the most instagram worthy spots are located away from the center corridor of the complex. We recommend taking a left from the main path and visiting the stupas toward the south. One thing that cannot be missed in Inle Lake is the dramatic sunset. Song of Travel Hostel has one of the most spectacular views of the sunset from its rooftop restaurant. As the sun makes its way behind the mountains to the West the sky glows in various shades of reds, pinks and oranges. Enjoy our Happy Hour on the rooftop from 5 to 8 with the best deals on beer and cocktails in town. Did you know Myanmar is a producer of wine? Some of the country’s best wine comes from the Red Mountain Estates Vineyard & Winery. Though common enough varieties, the grapes grown at the vineyard have distinct flavors. The 8 varieties of Inle Lake wine produced here taste both familiar and unique. The winery offers a wine tasting for 5,000 kyat, allowing you a generous sample of four different varieties. On the west side of the winery you can enjoy dinner and drinks overlooking the sunset. The vineyard is an easy 20 minute bike ride from Song of Travel Hostel and you can take one of our free bicycles anytime. We also organize a free group trip every Wednesday at 4pm. The highlight for most tourists at Inle Lake seems to be viewing the traditional fishermen on the lake. The iconic image of the fisherman using one leg to paddle and the other to help manage the bamboo nets, has become very well recognized recently. While you will see plenty of actual fisherman out on the lake, the truth is these fisherman are reenacting the traditional method just for tourists. They are professional models and will pose to give you the best shots, but they do expect a tip in return. Please don’t photograph them if you do not intend to tip. The sunrise and sunset tours, organized daily at Song of Travel Hostel, will give you the opportunity to catch the perfect shot of the fisherman and their circular nets framing the sun in the background. 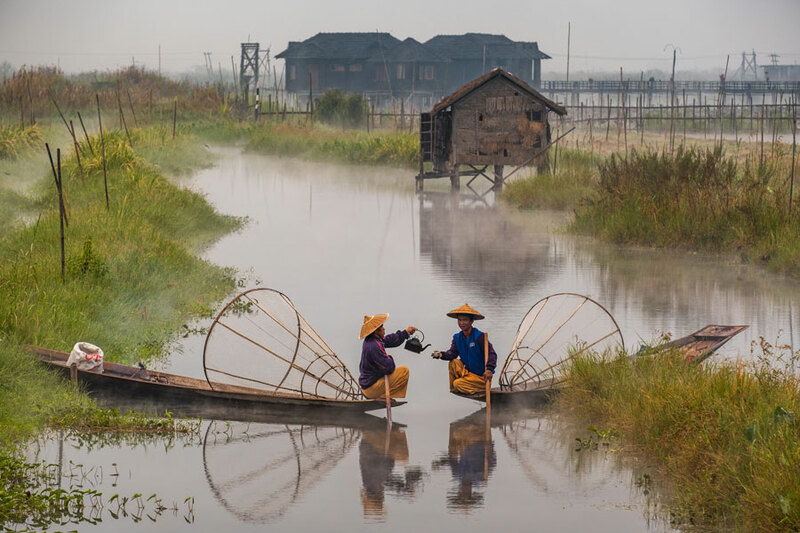 There is so much to see and do at Inle Lake, and certainly something for everyone. This is a list of our guest favorites, but there is still so much more to discover. Come to Song of Travel Hostel where you can look through our local guide books and we can arrange anything you would like to do.